Latest FHFA House Price Index Numbers are in! The latest FHFA House Price Index data came out for the Second Quarter of 2017 and I thought I’d spend some time on those stats. 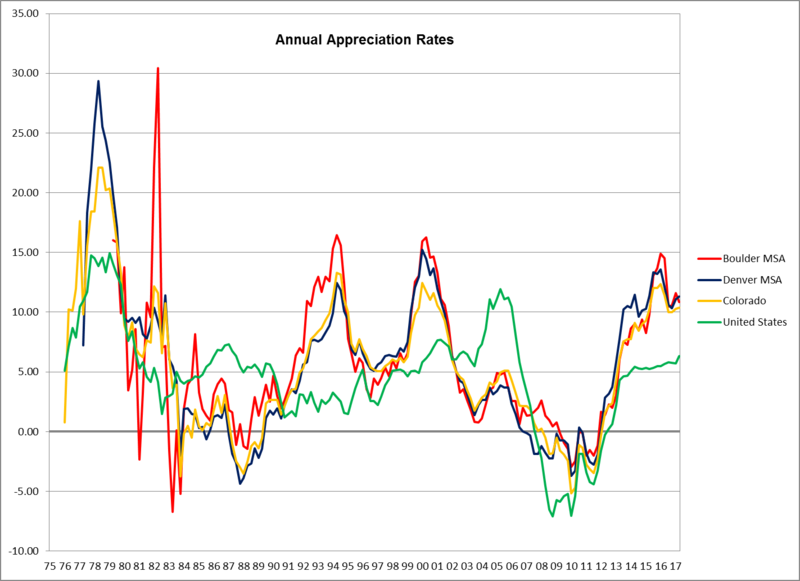 You’ll see in the chart below that Boulder County MSA, the metro Denver MSA and the State of Colorado are all off their peaks in appreciation as our current cycle shows some weakness. Overall, the US is still showing increasing appreciation. The Boulder MSA remains very strong compared to the other 354 MSA’s across the Country. Boulder ranks 1st for appreciation since 1991. Interestingly, Denver is 2nd and Ft. Collins is 6th. When looking at 5 year appreciation, Boulder ranks 31st, Denver is 22nd and Ft. Collins is 36th. For one year appreciation, Boulder ranks 20th, Denver is 17th and Ft. Collins is 10th. One quarter appreciation, has Boulder ranking 85th, Denver is 48th and Ft. Collins is 67th. The Denver Metro MSA is comprised of the City & County of Denver, the City & County of Broomfield, Jefferson County, Gilpin County, Clear Creek County, Park County, Douglas County, Elbert County, Arapahoe County and Adams County. In many of these rankings the Denver metro MSA is out stripping the Boulder County MSA and I think this is due to the generally lower price points in the Denver Metro MSA. They have more room for the frenzied appreciation we’re seeing occur on the lower end. Below is a chart from the FHFA website showing those appreciation numbers for the three MSA’s.